186 comments on "Me Made May Week 1 PLUS Win with Miss Maude"
What a great prize! She does have beautiful things.... I don't think I could go pass the Atelier Brunette Lili modal or their starry French terry.... as for patterns I think I've promised my love a Finlayson sweater.... and as for mmm photos, I'm a bit like you, am a reluctant model at the moment! ooh, fun! i would love the bye bye birdie cotton and the deer and doe shorts pattern i have been eyeing for ages! Their fabric is lovely, love the organic cotton walk with nature and the Deer and Doe Sureau dress pattern. I'm not doing daily me made photos this year either, but an end of week look back. I would absolutely choose the -LIBERTY DUFOUR JERSEY - MEADOW RAIN and either the Kelly Anorak or the Clare Coat! I think I'd want some of that beautiful linen! 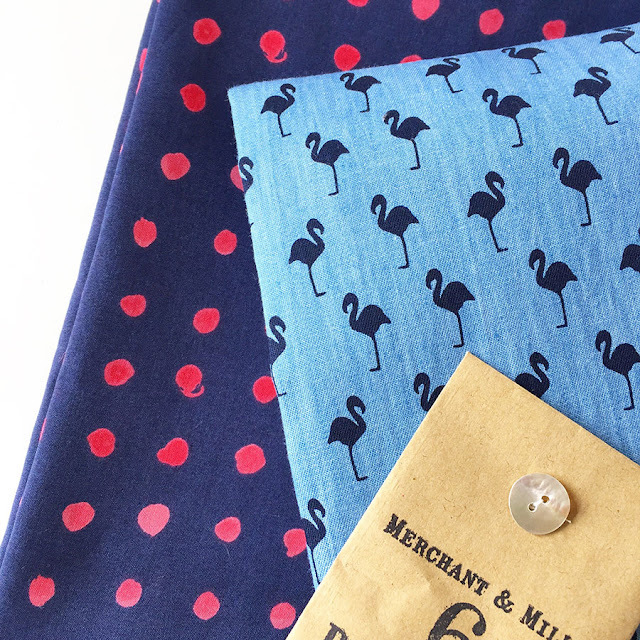 Some lovely fabric, including that cute flamingo chambray. I would probably get the Lark Tee and Liberty Dufour Jersey - Hesketh/Coral, a beautiful knit fabric which reminds me of 30's designs. Wow, what a great giveaway. Tilly's Zadie dress and some Liberty Hesketh jersey, either coral or navy, would be fabsy! Oh what a fun giveaway, thank you! I would make the Roza shirt dress with Organic cotton Lawn - HYDRANGEA. So hard to choose! Luzerne trench and some canvas! I am having so much fun seeing everyone's me-mades! I love how here in the Western US we begin seeing posts from the next day each evening. Fabric-wise, I would love the Indigo Splodge from the Little India collection. What beautiful fabrics Miss Maude carries! What an awesome prize. 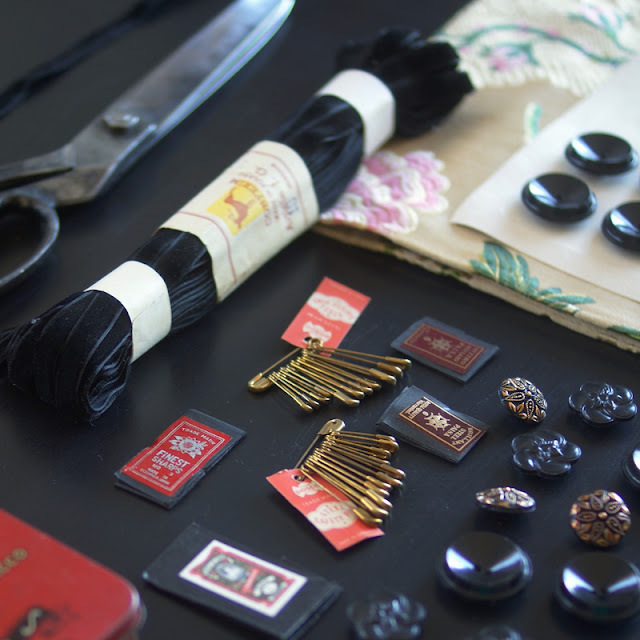 I just discovered Miss Maude recently, such a glorious selection of sewing goodies. I'd love to have the Wren dress pattern and make it in some LIBERTY DUFOUR JERSEY - DOT. Wow what a great prize. I would love to try the Cashmerette Appleton dress. A Liberty jersey would be great to try - Nicolas James is gorgeous. I would choose the Brumby skirt by Megan Nielsen in midi length and viscose in Coral Blossom or cotton batiste in Golden Moon by Atelier Brunette! Oh, how many gorgeous fabrics to choose from! But I think the one I could wear the most once turned into something cool would be the Sulphur laundered linen. Maybe into a Fielder dress from Merchant and Mills? Or a Farrow dress from grailine studio. Those Bye Bye Birdie prints are fantastic! And I'm totally in love with the Tilly and the Buttons Francoise dress! Great giveway! Thanks for hosting it. I would choose Colette patterns ginger skirt and the organic cotton poeme. It's so hard to decide! I am intrigued by the Papercut Patterns Coppelia top and the woven modal Lili fabric. Organic cotton herringbone in black and I'd love to sew the Named Clothing Sointu kimono tee! Thanks so much for the giveaway. Miss Maude seems to have an incredible range of fabrics. I think I'd choose one of the atelier brunette fabrics. What a fantastic giveaway! I love all of the cotton batiste fabrics on Miss Maude so much but honestly I'd probably just hoard them (waiting for the perfect project). I am going to try making jeans soon, so sensible me would choose the Named Jaime Jeans pattern and stretch black denim. So hard to decide, I love the Viscoe Crepe - Tangerine and the Morris Blazer from Grailine Studio's is always a pattern I have wanted to make. I think i would go for the scout t by grainline as i have had my eye on it for awhile. I think it would great in Sparkle tangerine cotton batiste. Thread Theory Jedediah Pants and Shorts for my husband and the fabric I would choose is Liberty Dufour Jersey - Nicolas James, Teal cos it's my favourite colours and a little different. Whoever wins this prize is going to be a very lucky person! Wow, so many beauties but I'd go for a Merchant & Mills Trapeze Dress from Sweeps Scrim European Laundered Linen. Gosh! So many options! Wonderful prize! I think I'll go with the Paper Garden Liberty Dufour Jersey in crimson, it is gorgeous! And Deer and Doe Datura blouse. Wow! What to chose!!!? It would have to be lili, so beautiful. But to sew it into a dress, skirt or top???? What an Amazing giveaway! Her site is gorgeous...so many beautiful things! I was immediately drawn to the Skirt with Godets Le 403. For fabrics I love the Viscosa crepe in Tangerine and the Liberty Dufour jersey in paper garden blue. I'm loving this Me Made May and having fun documenting what I'm wearing! I didn't know about Miss Maude's, so I'm delighted to have found a new source of beautiful organic fabrics - they have a nice range. I'd go for the organic cotton poplin in hydrangea for a summery shirt dress. ooh what an amazing giveaway! i would choose the liberty dufour jersey in dot, and the closet case patterns nettie :) thank you! I love so many of the patterns on at Miss Maude Sewing and even more of the fabric. I really like the Merchant and Mills The fielder top and dress. It's simple, but dreamy in Linen. I also love the European Laundered linen in Goodnight ��. My goals for mmmay17 are going well so far. I'm wearing me made everyday and I've already completed my goal of altering a me made skirt. Hi there - lots of great inspiration there. I'd love to make the Merchant & Mills Camber dress in organic black cotton herringbone. Nice to autumn/winter which we are just going into here in NZ! I love the Bye Bye birdie batiste or the organic hydrangea fabric, and would choose either the ginger jeans or the Centauree Dress. So much eye candy to choose from! Oh, I love her taste in fabrics. I'm in desperate need of simple day dresses, so I would go for that striped laundered cotton/ linen, or the liberty jersey, so gorgeous. 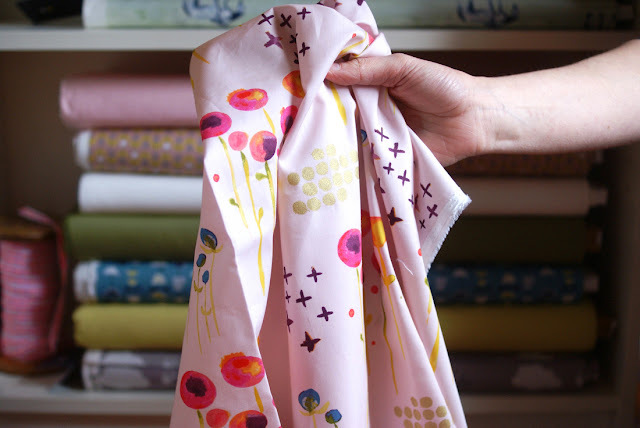 Carol Oldfield I love Miss Maude's fabrics and find her site very inspiring. If I won I would choose the Named Clothing Astrid Wrap Trousers and Shorts pattern and make the trousers up in the Viscose Crepe - Amarante (Plum) - what a beautiful combination that would be! I would love some of that French Terry! I'm also really keen to make the Kelly Anorak so I would choose that pattern! I've been drooling over the cotton batiste cosmic blue and the draped asymmetric top. I think they would make a great combo! I would go for the SEWAHOLIC FRASER SWEATER and the FRENCH TERRY - TWINKLE NIGHT, because I love that fabric so much. Ooh, what an exciting prize! I would probably pick the European laundered linen in oxblood and would definitely pick the Reeta midi dress by Named Patterns! The knits look awesome! I love the Dufour coral one. And a pattern would be the Myrtle. oh wow, what a beautiful shop! I've been wanting to make the Named clothing Kielo Wrap Dress for a while. As for fabric, the Little India Collection is wonderful but I think I would go for the European Laundered Linen in silt grey. Thanks for a wonderful giveaway! Happy Me Made May! Oh man, it's so hard to choose. Such beautiful fabrics and patterns! I think I would settle on the Merchant & Mills Fielder Dress in laundered oxblood linen. Amazing giveaway! What a lovely give away, I'll never pass on the chance to dream-match patterns to fabric! Oh, how I would love to make the Deer and Doe Aupepine in that beautiful and floaty Atelier brunette lily modal. Oh! I've had my eye on Miss Maude since it was mentioned in a post on the Curvy Sewing Collective Facebook page. That European laundered linen is delicious, especially the Goodnight colourway. I wonder if it would be the right weight for an Avid Seamstress Raglan dress? Thanks for the giveaway! I really like the Diamonds on Navy knit, I've been searching for a good windowpane fabric for a while and the triangles are a fun alternative! The pattern was much harder to choose, maybe the Cashmerette Appleton? Oh, such a perfectly curated collection of patterns and matched fabrics! I love either the Named Jamie jeans or the Morgan jeans pattern (I have the Ginger jeans and I'm on a roll) and naturally the Ink denim and who wouldn't love either of the Liberty floral denims? I would love to sew a Liberty denim! I am completely in love with my Fielder top pattern but could be swayed by the KNIT ASYMMETRIC SWEATER LE 002 with Liberty Dufour Jersey in blue. It would look like Toile wallpaper and tell a unique story. Your website and facebook post say to head over to Jennifer Lauren Handmade, her site says to head to yours!! So I am positing EVERYWHERE just in case!! Pattern would be Artemis, by I Am Patterns, and the fabric ... oooh trickier! Either classic black denim, or the stunning houndstooth. I would love the some hand blocked cotton, and the lovely cotton bastiste. My pattern, the Avid Seamstress's raglan dress and top. So many Beautiful fabrics! I'd love to make a Deer and Doe Hoya blouse with the hand block printed cotton Indigo pond Life. I love the Organic Cotton Poplin in Swoop - loving birds at the minute! and the Sewaholic Oakridge Blouse! Need more blouses in my life! I would love to give the Deer and Doe Datura Blouse a go - most likely all variations. Love the button back and cut out detail. I would choose the Liberty Morning Dew and the Moneta Dress. What an amazing giveaway! I would choose two metres of Merchant and Mills fabric, probably some of their washed linen. I'd also get the Union Dress pattern to sew with the linen! Woven viscose - Halo dusk, and the Merchant & Mills Fielder dress pattern :) Nice and slouchy! Great giveaway ! I would love the bye bye birdie and the Bruyere shirt pattern, or the Poem poplin... Or the goodnight linen! So many gorgeous fabrics. So hard to choose from so many gorgeous patterns and fabric. I would love to try a Tilly pattern in some shade of mustard or Navy. What an awesome prize! I'd love to win the EUROPEAN LAUNDERED LINEN - Goodnight and the Hemi dress top pattern. Thanks for giving me a chance to win! I would pick the Colette Moneta dress and some Liberty jersey to go with it! Such a hard choice though, the Scout Tee is also very tempting! Thanks for the give away! I would love the Cotton Batiste - sparkle Powder Gold or the Deer and Doe pattern of the Sureau dress. Colette patterns, hawthorn dress using the European laundered linen in Boston fall. Oh please let me win this! I'd love to try Colette's Phoebe in Liberty's E1 denim -Adriatic A.
I love the French terry sparkle fabric and would be great to try the Daydress by the Avid Seamstress. Fingers crossed! Wow how do you choose? I love the Twinkle Night French terry but would have to have a long hard think on the pattern. I love the EUROPEAN LAUNDERED LINEN in the Oxblood colour, and for a pattern, I'd chose the Deer and Doe Chardon skirt. Oh my such gorgeous fabrics, notions and haberdashery! Thanks to # MMM17, we r now connected! I propose my winning combo: Grainline Studio's "Farrow" Dress w/ European Laundered Linen in Goodnight! During the day I teach nursery school and that dress in that lively, comfy and breathable fabric gets 2 thumbs up! Fingers crossed! Miss Maude's collection is amazing! I would choose Sun Spots cotton and Tilly's Airelle skirt. I love the assymetrical buttons. Thanks! Wow, so many choices.... perhaps Talvikki sweater or Cupidon sweater (I have a dearth of sweaters in my wardrobe). Omg, the oxblood linen!! So beautiful! Oooo! I've been wanting to make a Deer and Doe Melilot for the longest time! It would be divine from cotton batiste in Chalk Charcoal! Such beautiful fabrics and such a difficult choice! I think I would go with the Irish Linen - Vincent Check and make a Named Helmi Tunic Dress. I'm loving the Sewaholic Oakridge Blouse! Looking through all the patterns was incredible - there are a lot of stand outs and it was hard to choose! Love the Named Clothing Raglan Tee. Think it would be so much fun in the cotton knit diamonds on navy. I'd pick the LIBERTY DUFOUR JERSEY - NICOLAS JAMES, TEAL fabric and the ILLY AND THE BUTTONS, BETTINE DRESS pattern. Oh my gosh this would be so amazing to win! I would love the LAUNDERED COTTON/LINEN STRIPE - OLAND BLACK and I would make a DEER AND DOE PATTERNS - MELILOT SHIRT. Getting this fabric and pattern would make a truly special staple item in my wardrobe. I love love love the idea of Appleton dress paired with Liberty Dufour Jersey in coral. Thanks for the give away! I've made my challenge easier this year - wearing 2 items a week. Post baby I still don't fit into my old wardrobe and a lot of it isn't practical. (Maternity wardrobe? Let's not go there!!) It's crazy how much it's changed. I'm looking forward to creating more things to suit my changing lifestyle. I love the pattern MEGAN NIELSEN SUDLEY DRESS AND BLOUSE and the laundered linen in Milk - what an awesome giveaway! And because I love a couple of patterns - THE AVID SEAMSTRESS - RAGLAN DRESS AND TOP and the laundered linen in Oxblood! (because I love Emma's Me Made May trousers that she took a pic of the other day!). That linen just looks amazing. I love Miss Maude, Emma has the most amazing selection of fabrics and patterns! I am lusting after the Laundered Linen/Cotton stripe in Orland Black, and the Named Reeta Shirt Dress pattern. What a great giveaway! I just fell in love with the fabric Organic cotton lawn Wildflower, that would be a wounderful summerdress! And the pattern Named clothing Jamie jeans I really like and I have a perfekt ochre colored fabric for that. I would like the Cashmerette Springfield Top and the Cotton Batiste - Garance. Many lovely fabrics to choose from, it was hard to decide. I'd love to make the Colette Patterns Moneta Dress in French Terry - Dazzle Night if you get it back in stock or Cotton Knit - Diamonds on Navy. Would love to sew the Grainline Studio Cascade Duffle coat made in the organic cotton hydranga fabric. Very nice! I am enjoying my first Me Made May so much. In my dreams I would choose the Megan Nielson Flint Pants made in dark blue cotton chambray. Then there are so many lovely fabrics to make matching tops! You're not kidding about losing time on that site! I've never sewn with an Atelier Brunette knit - the Twinkle Night french terry is beautiful! I would love the Morgan Jeans pattern. 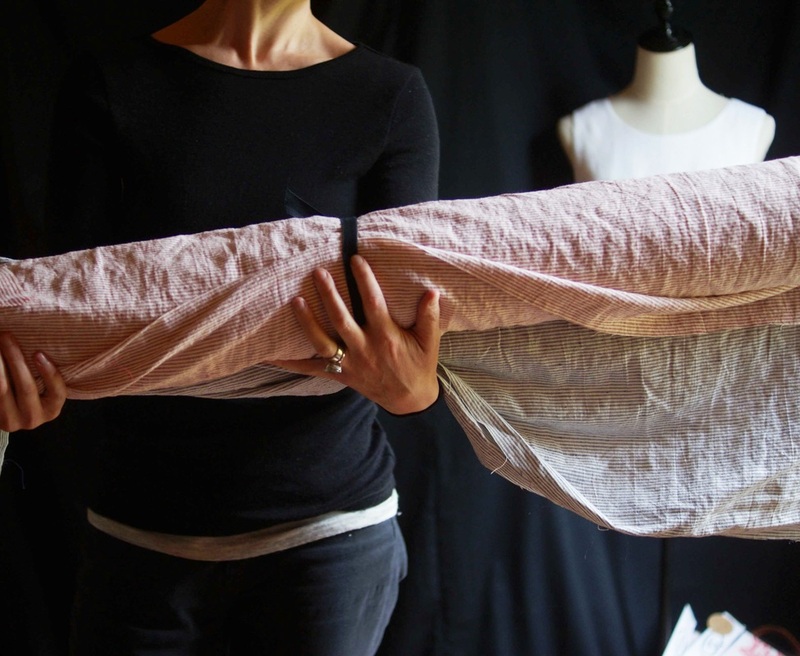 The fabric would be a much harder choice ... either a denim, or the Wildflower organic cotton lawn, the Poem organic poplin. She has so many gorgeous cottons! I'm really loving the Papercut Patterns Watson jacket, as it's something I would probably wear but a pattern I might not buy for myself (as they don't offer it in PDF and their paper patterns are a wee bit expensive what with shipping costs)! As for the fabric portion, gosh. There's so many lovely ones to choose from! I have a real love of linen, though, so I think I'd have to go with the European Laundered Linen in Demon Scarlett! It would be good for so many things I'd probably have a hard time choosing what to make of it, honestly. So many beautiful fabrics and patterns but my sensible head tells me that I should get the Closet Case Patterns Carolyn Pyjamas pattern and some of the organic cotton lawn in brush to start resurrecting the woeful state of my nightwear. Beautiful selection! I like the liberty and French terry along with everything else! Thanks for the chance to win! I would definitely pick the Bye Bye Birdie cotton batiste in navy :) And I'd go with the Archer shirt to use the fabric with! Such a fun combo and I've always wanted to make an Archer. Wow! It was hard to choose, but I'd go with the Megan Nielson Rowan tee and the Liberty Dufour jersey in blue Paper Garden. I've been eyeing the Kielo wrap dress by Named for a while! So no doubt I'd go for this! Thank you Miss Maude! I would love the Liberty Dufour Jersey in Hesketh, Navy - what a stunning print! And I've always wanted to sew a Grainline Willow Tank Dress so it might be time I got the pattern! What an awesome prize to win....if im the lucky winner I would choose the papercut pattern bowline sweater pattern but would have to take Emma's advice for the material! Oh my! I feel like a kid in a candy shop. The indigo pond life is gorgeous, actually the whole collection is lovely - this would be some special selfish sewing. I've been eyeing the moneta pattern for an everyday work horse - this would be for sensible sewing 😉 thanks so much for a wonderful opportunity! wow what a choice. think i'd go Deer and doe Bryuere shirt with some European laundered linen in silt grey. I would love love love to win some of the neon pink diamonds cotton canvas & as for the pattern the papercut patterns bowline top looks great! What a generous person the owner of Miss Maudes must be. I absolutely adore the Liberty Defour jersey in teal and would love to make it up in the Cashmerette concord t_shirt. So many lovely things to buy I am going to bookmark this shop for future reference. Thankyou for allowing me to enter. Been wearing khaki me made jeans today. I love to sew. So many choices - I'd look at the E1 denim floral filigree and the gorgeous Named Clothing Maisa denim jacket. Wow, this is awesome. I really like the European Laundered Linen in Goodnight and the Merchant & Mills Camber Set Pattern. I love the liberty denim and also the very first one I saw: the Indigo Daisy handblocked cotton. As for patterns, I love her selection. My favorite is Papercut Patterns, Sea Bell Dress and Skirt. I would like the Deer & Doe Bruyere shirt and think that the Laundered cotton and linen stripe in Gotland red would be fun to work with. I'm loving joining in mmm17, it's my first time. Not heard of this company before but super fabrics. I love the Wildflower cotton lawn and the Megan Nielson Dove top which has been on my 'to sew' list since it came out. Loving all the me made inspiration going on. Named Clothing Astrid Wrap Trousers and Shorts would be the pattern I went for. Good grief do I need more trousers. The fabric would be some beautiful liberty print denim. Beautiful but beyond this humble nurses pocket at present. I have been eyeing up the skirt with godets or thw kimono top bith by the frwnch label. Fabric shoppers dream at Miss Maude. Just love so many of the fabrics. One of my favourites is Liberty DuFour Jersey Spring Silhouette Navy. The pattern I have been looking at is Granline Studio Morris Blazer. Wow, so many amazing fabrics to choose from! I think I would pick any of the liberty knits. I would have a hard time choosing a pattern! I totally understand about losing enthusiasm for taking photos every day of Me Made May. I feel the same. For myself, I will keep trying but not every day. The selection at Miss Maude's is stellar! I would love to try outerwear, particularly the Isla Trench by Named in the Floral Filigree A denim by Liberty of London. Wow, that would be incredible! Thank you for the giveaway. What a great giveaway. Making a choice wasn't easy due to all those beautiful fabrics, but I've two beauties two match. If I'am the lucky winner I'am going to make Megan Nielsens Darling Range Dress using the Indigo Splodge fabric from the Little India Collection. Thank you for the entry! I would choose the Cotton Lawn in Sky - I love the colours! and I've had my eye on the Grainline Linden Sweatshirt pattern for a while now. Thanks again. Great competition. Hard to decide but if I won I would like the "Avid seamstress sheath dress", and the hand block printed cotton "Indigo Splodge". My fingers and toes are crossed. You have a great selection; very nicely curated! I would love to make the Merchant & Mills factory dress in oxblood or silt grey laundered linen for the coming summer (not this year, probably). Ooooo Miss Maude, so many choices. I would delight in the organic cotton poplin in 'sprig' or 'hydrangea' with The Avid Seamstress City trousers pattern. Thanks for introducing me to this very well curated shop! I spent a marvelous time there with dreaming and imagining nice clothes... Tonight my choice would be the INDIGO SPLODGE from India and the Merchant and Mills Top 64. I like all the cotton ones and really like Liberty Dufour Jersey - Spring Silhouette, Navy. I would probably get a dress pattern. Awesomeness giveaway! I would choose the Cleo Pinafore pattern by Tilly and the Buttons and the Liberty Of London E1 Denim in floral filigree A. Or the cotton canvas tulip? So many fab choices! I would make the Sheath dress out of the Vincent check linen... dreamy! So hard to choose, but I would pick The Avid Seamstress Raglan Dress and Top pattern and the Liberty Floral Filigree denim. Thank you for a great competition! I have had my eye on the Tilly Chloe pinafore pattern. I think I'd see it in some livery denim....or flamingoes. Too many choices, change my mind each time I look. nicolas james in coral, and I would love to try out the Megan Nielsen Darling ranges dress and top! Great to know there is such a nice fabric store in nz! Beautiful shop and amazing prize! I'd make a Grainline Morris blazer in the 'sweeps scrim' black linen. I love the Cooper bag pattern! Thank you!